b5Studio: A one and a two . . .
My goof is your gain. A set of 12 Oriental Rugs. Your sims feet will thank you. Remember that problem I was having? 12 rugs that looked the same? You have twice the selection. That is 24 rugs for the mathematically stunted. Two files though . . . can't have it all. Gotta work for some of it. These are all hand tied pixel by pixel. and well, maybe not you. I'm a sucker for vintage rugs, so I love these! Absolutely beautiful! FYI the thumbnail problem persists in my game: It shows the same stripey rug for all designs. Well crap . . . I am sorry to hear that. The problem I was having was that I had chosen 12 similar colored rugs that only appeared to the be same icon due to their similarity. This is something entirely different and I don't honestly know what to say to help fix it. My understanding is that they game generates the icons for the styles. TSW generates an object icon. Personally, I use the package file in my game so the game even generates that icon . . . anyone else having this problem? 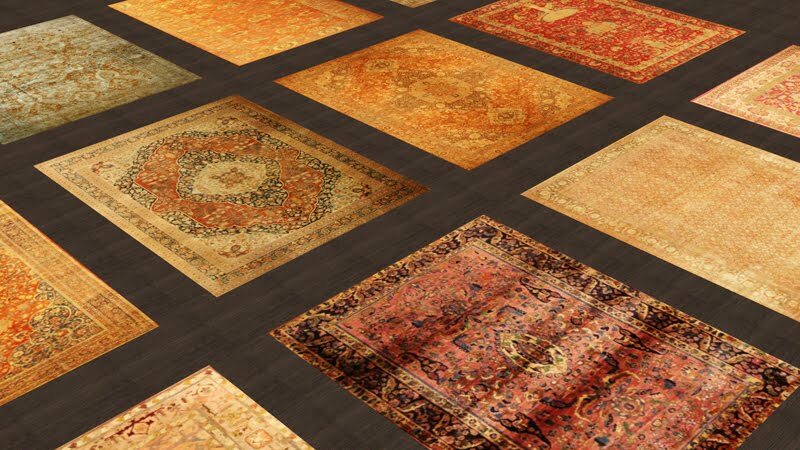 These are gorgeous rugs - I can't wait to try them in my game - it'll be like pot luck apparently - with the one icon - but what the hey - I like surprises. Thanks! 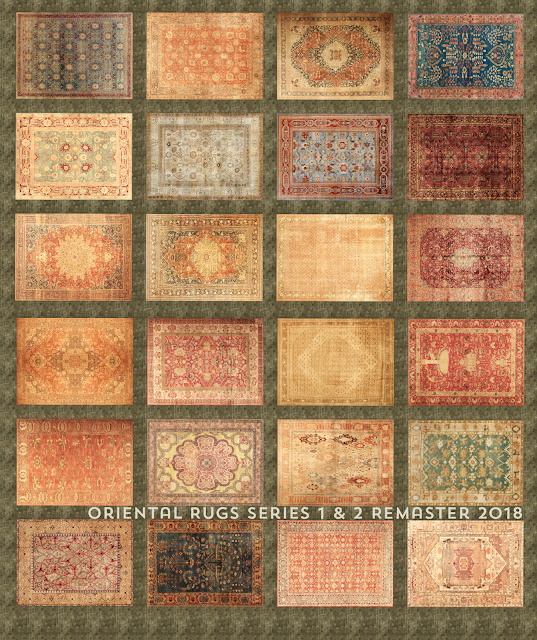 It was not a problem of the icons showing up incorrectly but that I had chosen poorly 12 rugs that looked so much alike that it was impossible to tell the icons apart. Anyway - sorry folks for the confusion - sorry, too, to those who may be having trouble with the icon - I really don't know if it is specific to some systems as I only have the one noted trouble. I will just keep an eye out for feedback. Jessica: I have attempted to locate an answer but I am not having much success. Others have suggested clearing the four cache files stored in your document folder as a way to update the icons. That does not work for me on the few problem items I have in my own game . . . perhaps it will work for you. Keep me posted. The link is broken for the 12 Oriental Rugs. Can you fix this? Thanks. Hi Damien - thanks for pointing that out - I don't know how it got switched?? It's worked for 172 people since I updated the file to be CASt-able. Blogger is funky sometimes! Thanks for pointing it out - I have rechecked the links and they are both now working.